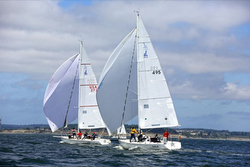 (Whidbey Island, WA)- An annual right of passage in the Pacific Northwest is to attend what many consider to be the “adult summer sailing camp” of the year- the infamous Whidbey Island Race Week. It’s not hard to see why it’s so popular with sailors from the state of Washington and the province of British Columbia. The entire week is predicated on having fun and the social calendar is heavily populated with all kinds of fun events. That there are twenty-eight J’s racing of 68 boats registered (1/3 the fleet) is a testimonial to the broad popularity of the event. Sailing in PHRF 1 Racing are three J/109s (Ed Pinkham’s JEOPARDY, Tolga Cezik’s LODOS, & Stu Burnell’s TANTIVY), Chris Johnson’s J/120 WITH GRACE, three J/29s (Veli-Juhani Levaho’s AMELIE, Christie Nelson’s SLICK, and Pat Denny’s HERE & NOW), Rex DuPuis’ J/30 GADZOOKS, Jay Pyles’ J/33 DASH, and David & Vernice Cohen’s J/90 EYE & EYE. The ten-boat J/105 Class includes Tom Kerr’s CORVO, Jerry Diercks’ DELIRIUM, Chris Phoenix’s JADED, Jim Geros’ LAST TANGO, Erik Kristen’s MORE JUBILEE- in other words, the creme’d’la’creme of the Pacific Northwest J/105 fleet. The J/80 class continues to expand. This year there will be six boats, including Mike Poole’s JOLLY GREEN, David Schutte’s TAJ MAHAL, Mike Gridley’s CRAY IVAN, and Lek Dimarucot’s UNDERDOG. Finally, in PHRF 9 Cruising enjoying the festivities will be Steve Kirsch’s J/35C WILDFLOWER. 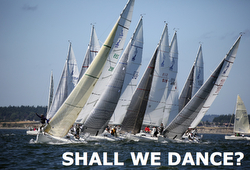 For more Whidbey Island Race Week sailing information Add to Flipboard Magazine.